Sylvania Serpentine Hot Air Heaters and Systems! 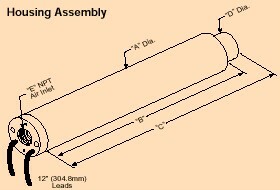 E Shop : Process Air Heating : Serpentine Heaters Triple Pass! 30 Years of experience with process heat and temperature control! 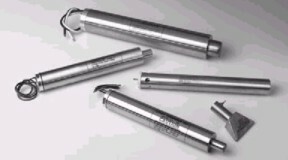 The Serpentine Triple Pass Heaters are designed to provide a controllable, high-temperature source of hot air. Offered in two sizes, the Serpentine II is available with replaceable heating elements rated at up to 3.6 kW, and the Serpentine VI up to 6.0 kW. The Serpentine Triple Pass Heaters are capable of producing extremely high exit air/inert gas temperatures, up to 1200°F (650°C) with standard heating elements, and as high as 1500°F (815°C) with the "Two-Stage" heating elements. Low thermal mass results in an extremely fast response heater, taking only 6 seconds to reach peak operating temperatures. We offer control systems that can control exit temperatures to ±2°F. The unique design of the triple-pass heat exchange housing uses the incoming air to cool the outer shell prior to directing it over the Serpentine Heating Element. Radiant heat losses are eliminated and installation design and operator safety are simplified. The replaceable Serpentine Heating Elements allow for quick changeovers, minimizing downtime. To determine the proper size heater, plot a point on the Datasheet Heater Chart, which defines your required air temperature and flow. The nearest curve to the right and above this point represents the proper heater selection. Then Click here to determine your require Wattage. and check out the definitions and theory Page.